NBC renewed the TV series Better Late Than Never back in September, but we’ve heard few details about season two since. Now, star William Shatner has revealed some news about the upcoming season. 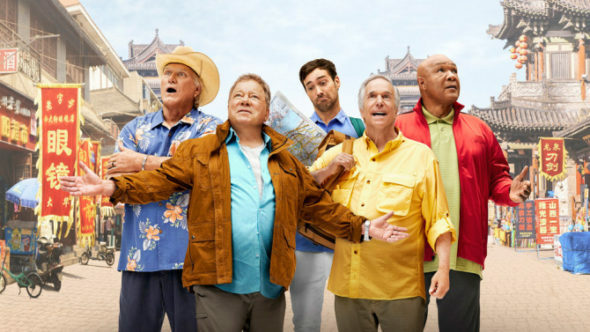 The show follows Henry Winkler, William Shatner, Terry Bradshaw and George Foreman as they embark on the journey of a lifetime, traveling on their own, with no schedule and no itinerary. The only help comes from Jeff Dye, a young tech-savvy comedian. He has an agenda of his own and he isn’t above leading the men off track. Recently, Shatner told CBC’s The Morning Edition that he’s “off to Germany to shoot the second season of Better Late than Never.” Shatner also told StarTrek.com that the new season will feature the same stars as season one. NBC has not yet announced a premiere date for season two of Better Late Than Never. What do you think? Did you see season one of Better Late Than Never? Will you watch season two? More about: Better Late Than Never, Better Late Than Never: canceled or renewed?, NBC TV shows: canceled or renewed? Better Late Than Never: Cancel or Renew for Season Two?